A diamond is measured using a weight measurement called a carat. A carat is equal to two hundred milligrams. When a diamond is spoken of as four grains it is a one-carat stone. Carat gets its name from the bean known as a carob. In the past if the stone weighed the same as the bean it was said to be one carob, which became one carat. In the east, rice was the unit of measurement that was used. Diamonds that weigh the same as four rice grains it was what we now call a carat. Most diamonds that are bought today are for diamonds that are one third of a carat. You should use some care when you are shopping for diamonds that are already in settings. If the jewelry contains more than one stone in the design the piece will be marked with a carat total weight. This is the weight of all the stones in the piece of jewelry. You will need to ask if you are to know the carat weight of any of the stones in the jewelry. 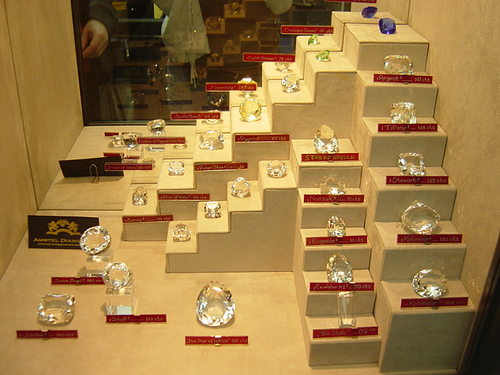 There are so many diamonds available in jewelry stores it is hard to think that they are actually a rare item. Many people don’t even wonder how that diamond that is in the jewelers case made its way into the store. There is a great deal of work involved in bringing a diamond to the condition that would be sold in a store. When diamonds are mined, there is only one quality one carat diamond found in one million that are mined. At that rate it would take five million diamonds to find one two carat diamond. Two hundred tons of ore will need to be mined to find just one diamond. It is even possible that those that are found are only industrial quality. These are the diamonds that are used on drill bits. When you walk into your local jewelry store take a good look at all the one carat diamonds. These stones are worth so much because of the work it took to bring them to the jeweler’s case. They are a one in a million item.